Daily Design #266. Candy Canes. Daily Design #266. Thinking about candy canes today. Not my favorite candy by any means but I do like their design. Also been getting a lot of Duran Duran traffic the past few weeks. Just want to say welcome. I am listing to their new album right now and it is absolutely a pleasant surprise to say the least. The best album from them in years! See you all tomorrow with another design! ~Sean. Music Art #10. Duran Duran, Strange Behaviour Tour 1987. I was informed earlier today that the band was sent the link to Circadian Creative! So John, Nick, Simon and Roger – Welcome, I hope you like what you see and thanks for stopping by! Also, thank you for 30 years of great music! Follow this blog on Facebook and Twitter. Thank you all for your support! Music Art #9. 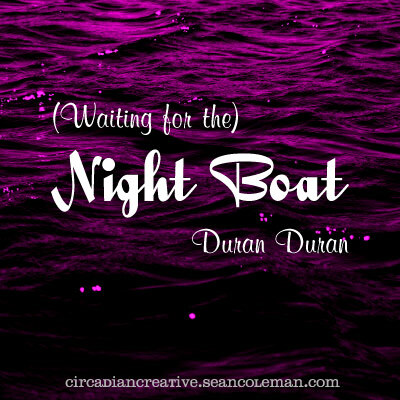 Duran Duran, Night Boat. Music Art #8. Duran Duran, My Own Way. Music Art #7. Duran Duran 1980-ish. Today I designed around an old Photo of the Fab Five! This image couldn’t possibly have been taken anytime after 1982. This design addresses nothing specific. Just the band as they were right before they took the music world by storm. I was humming the tune Planet Earth in my head as I worked this on up. “Bop bop bop, Ba Bop bop bop ba, this is planet earth!” I posted the video on the Circadian Creative Facebook page if you are feeling nostalgic. Enjoy. Music Art #6. Duran Duran – King of Nowhere. This morning I was browsing Facebook and watched a video update from Duran Duran’s Nick Rhodes. He said the band was working in the studio material for a forth coming album. In fact, he mentioned the title of one of the songs. The title of the track is “King of Nowhere” so I was inspired to create artwork for the potential single. I kept to a minimalist design. Not knowing exactly what the song is about I chose the iconic crown to represent a king. The title of the song is set on the black half of the background, perhaps signifying a place called nowhere. Anyway, that’s it for today, hope you enjoy!